Each Christmas my wife and her siblings draw names to determine who will buy a gift for who. With four of them it was somewhat unrealistic for each of them to buy gifts for all the others, especially when some are in school. My name was added into the draw about 4 years ago, about a year after Kim and I had started dating. Since then, more significant others have been added and the draw is now split between seven of us. It’s a fun tradition and it helps bind us as a family I think. This year, I drew Blair, my sister-in-law’s boyfriend. I really had no idea what to get him until my sister-in-law noted how sparse his new apartment was. I thought maybe I could frame one of my images for him. 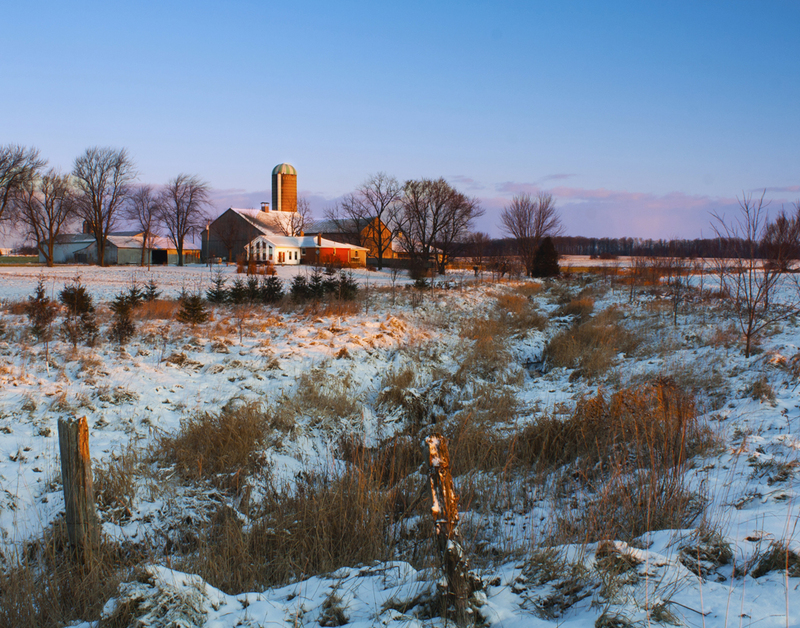 Even better, I thought, I could photograph the farm where he grew up and frame it for him. So I called his parents. Now I have never spoken to his parents before, but they were very nice about the complete stranger claiming to be their son’s girlfriend’s sister’s husband who wanted to take pictures of their house. They welcomed me in and suggested where I should shoot from. It worked out quite well I think. And Blair seemed to really like the result. Great image Mikey. I like how the eye goes directly to the buildings, then back out to the fence in the foreground then follows the ditch back to the buildings. Nice work. Thanks man. Overall I was pleased with the shot, especially the even exposure. Though I was never 100% satisfied with the comp, as I feel the ditch leads a little too far to the right, past the buildings. Still learning 🙂 Thanks for the feedback though!